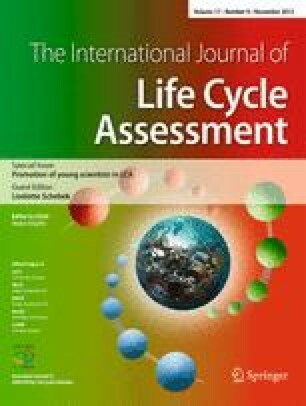 Spatial analyses in life cycle assessments are hardly ever conducted. The combination of geoinformation systems and life cycle assessments (LCA) databases is a way to realise such complex calculations. By the example of energetic utilisation of biomass via conditioned biogas a geoinformation systems-based calculation tool is presented which combines geodata on biomass potentials, infrastructure, land use, cost and technology databases with analysis tools for the planning of biogas plants to identify the most efficient plant locations, to calculate balances of emissions, biomass streams and costs. The calculations include the impact categories greenhouse gases, acidification, and eutrophication and were tested for the Lower Rhine region and the Altmark region in Germany. The results of the greenhouse gas (GHG) balances are presented. By using only nationwide available datasets, the calculation tool can be used in other regions as well. Balances of individual sites, regional balances and their temporal development can be calculated in geoinformation systems (GIS) using LCA methods. The composition of the substrates varies according to site and catchment area and lead to large variations in plant configurations and the resulting GHG balances and cost structures. GIS tools do not only allow the assessment of individual plants, but also the determination of the GHG reduction potential, the biogas potential as well as the necessary investment costs for entire regions. Thus, the exploitation of regional biogas potentials in a way that is sustainable and climate-friendly becomes simple.